Sarah and I took the girls on a trip to Colorado recently. We traveled to a section of the state that I had never been to before- Durango. This is a remote area! We flew into Albuquerque, New Mexico because it was the closest major airport. Then we drove 4 hours into Durango! It was a big day of travel. But it was totally worth it when we arrived. Stunning scenery. Beautiful vistas. One of the main attractions of Durango is its coal-fired train (pictured above). 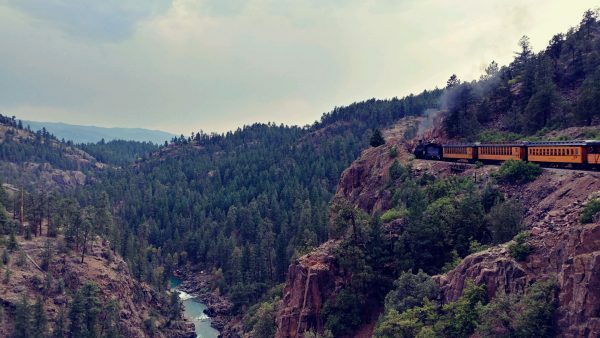 The train travels from Durango to Silverton and has been in operation since 1882. It winds its way through valleys and along ridges to offer incredible views of the Colorado landscape. At one point in the journey the train left the safety of the valleys and ended up VERY high up on a cliff. I looked out the window and thought, “Wow, that is a beautiful view…and a long way down!” It had to have been several hundred feet down. The train continued for the next 20 minutes to travel precariously close to the edge. I found myself needing to have a lot of trust in those moments. Trust in the train conductor to competently guide the train. Trust in the train itself, along with the tracks, to work as designed. Thankfully my trust was not unfounded, and it we safely made it back down. There are many times in life that we need to put our trust in things that are outside of control. Sometimes it is placing our trust in others. Sometimes it is choosing to trust that equipment will work properly (like a train!) When you think about it, faith involves a lot of trust. We trust that God will be there for us. We trust that God hears us when we pray. We trust that God will take care of us through hardship or pain. The psalmist spoke of faith as a journey of learning to trust God more each day. My hope is for Unity Presbyterian to be full of people who are actively searching for God. As we search, may we learn to trust God more and more. Perhaps a good exercise would be to examine the many different parts of our lives and consider what areas we’d like to grow in our trust of God. Areas such as our relationships, our finances, our goals, or our plans for the future. Trusting in God is not always easy because it involves relying on something outside of ourselves. Yet it is precisely in the process of learning to trust that our faith will grow and develop. On Sunday we will finish our Jacob series- and it will be a dramatic conclusion!